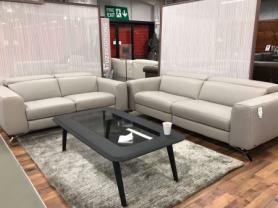 Upholstered in beautiful top grade coffee leather, highest category Dolce leather. Comfort and durability combined in this beautiful suite. Our display model ready for immediate delivery. Approximate Dimensions: 3 Seater L: 87.5" D: 40.5". H: 41" 2 Seater L: 65"
Come down to Furnimax and experience the world reknowned La-Z-Boy for yourself. Click the PDF icon below to download the datasheet for the La Z Boy Ava.